As a young officer, he qualified as a physical education instructor and was one of the first members of the elite army rangers. He served on many overseas postings, including four years in New York as a senior military advisor at United Nations Headquarters. Lt Gen Earley was Chief of Staff for the past three years. He played Gaelic football for his native Roscommon for 20 years from 1965 to 1985. He is said to be one of the greatest players never to win an All-Ireland medal. He later went on to manage Roscommon, as well as Kildare where he lived in recent decades. His son, Dermot, who plays with Kildare, has also won two All-Stars and his daughter Noelle is also an All Star. He is survived by his wife Mary their six children, David, Dermot, Conor, Paula, Ann-Marie and Noelle, and his mother, Kitty. In April, he was presented with the Distinguished Service Medal by Taoiseach Brian Cowen. He was succeeded as Chief of Staff on the 14 June by Lieutenant General Sean McCann. Lt Gen Earley is to be buried with full military honours in Co Kildare on Saturday. His remains will repose in St Brigid’s Garrison Church, The Curragh, from 1pm to 7pm on Friday. His remains will be removed to St Conleth's Church, Newbridge at 8.30pm on Friday evening. The funeral will take place to St Conleth's Cemetery, Newbridge, after Mass at 11am on Saturday. 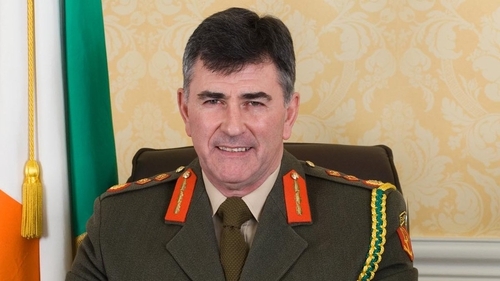 President Mary McAleese has expressed her sadness on the death of Lt Gen Earley. She said: 'I had the honour of knowing and working with Lt Gen Earley for many years. Taoiseach Brian Cowen said he was saddened to learn of the death of Lt Gen Earley. Mr Cowen said: 'Dermot Earley was one of this country's most distinguished public servants and through his commitment, his intelligence, his leadership and his charisma he brought great distinction to himself, his family and Ireland. Defence Minister Tony Killeen said: 'I have learned with shock and sadness of the death of the Lt Gen Dermot Earley. Fine Gael Defence Spokesman Jimmy Deenihan expressed his sorrow at the death of Lt Gen Earley and also sent sympathies to his wife and family. Fine Gael Leader Enda Kenny described Lt Gen Earley as one of the most iconic Chiefs of Staff of the Defence Forces since Michael Collins. Former Minister for Defence Willie O'Dea said: 'Dermot's passing is an immense loss for his family and for his wider family in the Defence Forces. 'One of the greatest honours I had as Minister for Defence was to be able to nominate Dermot for the position of Chief of Staff of the Defence Forces in April 2007.